Not long ago, I was asked to put down in a few sentences how private, licensed security firms and the individuals working for them help make Ohio safer. If you follow my writing at all, you know that I am a strong proponent of the concept that the only person who can make you safer is you. Still, though, there are circumstances in which security personnel add to the safety equation for a business. By keeping businesses safer, the employees and customers are safer. Logic would argue that safer businesses, employees and customers results in an overall positive effect for the state. I’ll very briefly examine three components of professional security which result in a safer community. The three are: Trained, Equipped, and Observant. We begin with the expectation that every individual employed by a professional security company in the State of Ohio is vetted. A requirement of the Ohio Department of Public Safety and the Ohio Department of Homeland Security is every person who holds the company license and every individual employed under that license undergo a thorough background check which includes an automated fingerprint check through the Ohio Bureau of Criminal Investigation and Identification (BCI&I). Likewise, any individual to receive on their license an endorsement to allow him or her to carry on-duty must also have a fingerprint record check through the FBI. First, then, in our list of items that professional security employers provide are agents who are: trained. We will begin with firearms. If a person is to receive an endorsement on their registration as a ‘firearm bearer’ they must first also show completion of either a 140 hour ‘civilian’ firearms qualification program credentialed by the Ohio Peace Officer Training Academy (OPOTA). The course must be supervised by an OPOTA certified instructor. The only other way in which a person working for a security company is to be a current holder of an OPOTA Certification as a Peace Officer in Ohio and records indicated a firearms qualification within the last 12 months. All firearms bearers must requalify annually. I have purposely not used the term security guards because of the injustice done to those who work as guards by Hollywood and media in general. The old days of a retired, older gentleman with a large ring of keys in on hand a thermos of coffee in the other strolling from one station to the next where he would insert a key that showed he had ‘checked’ that area and he’d amble on through the night, often afraid of his own shadow or just looking for a place to nap are long gone. As certain as I am that there were those who fit that description to a ‘t’; today they are working their way toward a high degree of professionalism because of the new threats that corporate America is facing in our ever-changing foreign political landscape and home-grown corporate espionage agents both in physical and in cyber security. Many companies use the term ‘officer’ and some such as my own company, use the term ‘agent’ to eliminate any confusion with local law enforcement officers. Training on the job is an important part of any company’s program for agents. The Ohio Department of Public Safety/Homeland Security makes available for all registered agents on-line training covering a wide-range of topics all of which are relevant to security challenges in today’s corporate climate. In relation to that, ODPS requires very specific insurance that also meets the challenges of today’s world. Equipping of law enforcement officers over the last decade has taken major strides in officer protection and in providing devices for recording interactions between citizens and the officer. Much of the same equipment is required for security work. Depending on the assignment and the location, a security agent may be wearing a uniform distinctively marked, a bullet-resistant vest, firearm, taser, and body-cam. Covert equipment has also taken huge steps in the last two decades. Constantly changing electronics and digital information recorders, covert recording devices, tracking devices and a multitude of tools have make it safer for investigations to progress. Agents must continually stay abreast of ever changing laws that may impact their work. The third area that I chose to help explain the concept that better vetted and trained security personnel with the best available equipment will help make the regions in which they work safer for all citizens is observant. The term we use at SCI and have stressed in all our citizen safety training publications and articles is situationally aware. Agents receive training in professional organizations on being always aware of their surroundings. We do not preach paranoia but awareness and readiness to act whatever the threat might be. SCI seeks to show everyone we train, whether as an agent or in a community based training, that being aware of your situation is the best way to stay safe and keep others safe as well. A great deal has changed in private security and investigations since Humphrey Bogart as Sam Spade hunted the Maltese Falcon. The world is at our doorstep and its time we prepare ourselves to open the door. I believe that Ohio and other states are safer because of the well-trained security companies that are working together to meet the threats that are facing our private sector world. I encourage them all to stay the course. Author docriggsPosted on 6,Jan,2018 6,Jan,2018 Format GalleryCategories Cyber Security, law enforcement, National View, SocietyTags ODPS, Ohio Department of Public Safety, Private Investigator, safety, SCI, security, Security Guard, Stretching the Thin Blue LineLeave a comment on Safer? Hell Hath No Fury Like a Two-Year Old Whose Grandpa is Arrested?! Then the other officer came… he was polite and professional but he was not about to be taken into Emmy’s conidence. Ok, perhaps “arrested” is not exactly the right term and Emelia isn’t quite two. It all began on our trip to Orlando as Emmy and I were at the Cleveland Airport going through passport control and security. Now, before I tell the entire story, allow me to say that Emelia has the greatest deference for police oficers. She should, at least. I am a retired Chief of Police. Emelia’s father is a county corrections officer and her uncle is a local police officer, not that this 1 year and so many month old little girl really understands that. I also need to say at the outset that we fully understand the dificult task that TSA officers have and why they needed to do what they did with me at the airport. Author docriggsPosted on 21,Jul,2015 Categories Family Life, National ViewTags 2 year old, airport, authority, badge, corrections, Grandpa, officer, Papaw, police, security, Stars and Bars, supreme court, TSA1 Comment on Hell Hath No Fury Like a Two-Year Old Whose Grandpa is Arrested?! All across America, there is a storm coming. The wind is just beginning to pick up ever so slightly. Some of the folks who have been around awhile, kind of like yours’ truly, are saying something like there’s a rain in the air, we can smell it; we can feel it in our bones… America, a storm is coming. Have you watched a summer storm begin long before the sky gets dark? It begins with a smell in the air. 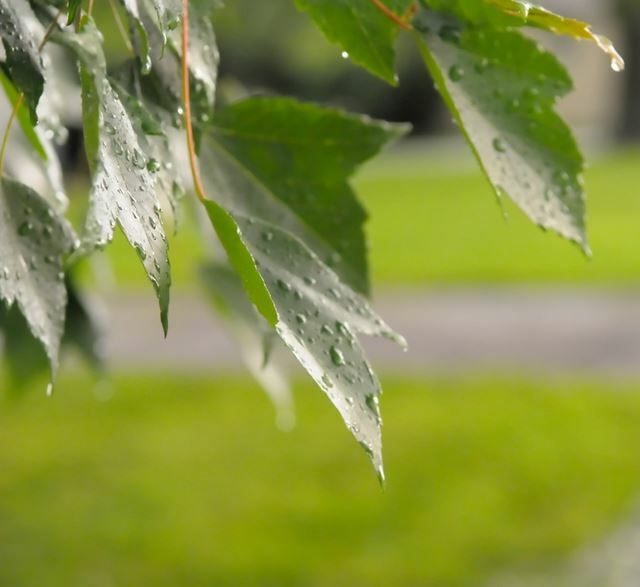 Your grandma may have said something like “It smells like rain…” and then the slight breeze that doesn’t seem to be anywhere except in the trees begins to rustle the leaves. If you watch closely enough it is almost as if you can see the leaves turn themselves over so that their porous underside can soak up every drop of the coming rain. Next the clouds begin to darken and the wind picks up a bit. If you are living on a farm you see the chickens and other small animals are anticipating the coming storm and they start to find some shelter. Some seem to not care and you understand where the phrase: ‘doesn’t have enough sense to come in out of the rain’ originated. The larger animals seem to know when things are going to get really heavy. 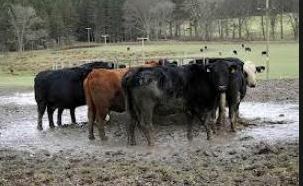 The cattle will group together and all of them put their backsides to the on-coming storm, huddled together for warmth and protection – there is a lot of common sense we could learn from animals. Some of the larger animals that have a season or two on them are moving slowly toward the center of the field if the path to the barn isn’t open yet for feeding time… they begin to move toward each other, starting to form a protective huddle. That huddle can be good if the storm is going to come and then pass you by but if it is a real cyclone kind of storm burying your head in a huddle might keep your nose dry; but you’re sure enough risking another part of your anatomy that is best not left in the wind! It’s kind of hard to defend yourself from the onslaught of what is about to come your way when the only thing you can see is the other cow’s nostrils. Maybe, America, instead of being a bunch of befuddled bovine, we need to begin to act more like the wild mustangs who are defiant of the wind in their mane. They snort and flare their nostrils, raise back their head against the stinging rain and rare up on their back legs, striking out at the storm and the lightning flashes as if defying it to come and get them. Certainly the animals that take shelter and huddle together, they know a storm is upon them are wise enough to recognize a storm before it hits. But unless they are completely resigned to just take whatever happens with a “just let me be and when its all over, if I’m still able to stand I will keep chewing my cud and hope the next storm isn’t as bad” attitude, they really have no hand in protecting themselves or the rest of the herd, including their little ones. 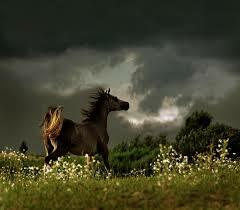 The stallion, the defiant one stands against the storm as if to say, “Not on my watch! No storm is going to take my life, my freedom, or my off-spring from me!” America, a storm is coming… I can feel it in the wind. Are you ready? Here at SCI we do not work by way of body counts but we focus on areas where our teammates and clients may be working or their families shopping and enjoying life – unaware of the Damoclean threat hanging over them. An unlikely ‘random’ bomb was apparently thrown in front of a Magyar National Bank (CIB) by a rider on a motorcycle who fled the scene at a high speed. No initial reports of injuries. Questions remain. This report will examine the implications of the following scenarios for the investigation: the intricate web of Hungarian national government control of banking; Hungary versus the EU in banking regulation conflicts; national banks competing with foreign banks for dominance in Magyar markets and the possibility of a random bomber attempting simply to create mayhem in the city center with the complicated bank issues and investigations as a carefully chosen ruse. For nationals and those living or visiting Budapest in the short-term, this report offers a new reality based on the introduction of a threat requires personal vigilance and mental preparation. Should bombings continue – Avoid high risk areas as future events identify those locations. As recently as February 2012, Hungarian Central Bank was involved in complex political maneuvering regarding the inter-connectedness between the national government and the operation of the bank. The prime minister held the power to dismiss the head of the Data Protection Agency, Judges and to vacate laws that made CIB an ex-officio part of the national government. Government officials wanted, at that time, to require that bank officers take oaths of office and acquiesce to salary caps determined by the government. The appearance of impropriety and the allegations of corruption for some time has led Hungarians to be concerned about the CIB interconnectedness with the national government. The 2012 political drama was followed by intercession from European officials who saw the Hungarian government’s controlling power over the CIB as a major hurdle for the nation to receive full membership in the EU. In April of 2012, European officials were notified that the Hungarian Economy Ministry had drafted legislation that amended previous laws which the EU believed limited the independence of the CIB to operate within the EU trade markets. Two immediate changes were to eliminate the requirement for a member of the national government to be present for meetings of the bank’s business. The law also eliminated the requirement that minutes of all meetings be copied to a member of the national government. Perhaps the most extensive and politically challenging issue was that the agency was pressed to drop its move for a constitutional amendment that would have permanently merge the bank with the country’s financial regulator, making the bank an official arm of the national government. These changes were submitted to the European Commission and are under review to determine to what degree these changes will enhance the country’s bid for full membership in the EU. “The Magyar Nemzeti Bank” is the Hungary National Bank which is also known as the CIB. According to the Act CXXXIX of 2013 on behalf of the Magyar Nemzeti Bank (MNB) which went into effect 1 October 2013: The Hungarian Financial Supervisory Authority and the MNB are integrated into one institution. Understanding that, the MNB reports that the European Supervisory and Market Authority has begun work on a reports on market abuse which may take into consideration the intra-relationship between the HFSA and the MNB (CIB). In a SITREP just issued today, intelligence sources in the United States report that Hungary is trying to gain more control over its banking sector. On Jan. 5, Hungarian media reported that Szechenyi Bank, which is partly controlled by the Hungarian government, has made a bid for the Hungarian branch of Austria’s Raiffeisen Bank. Unconfirmed rumors also suggest that another Austrian bank, Erste Bank AG, could receive a bid from the state. The rumors come as Gyorgy Matolcsy, the head of the Hungarian central bank announced that four major foreign banks could leave Hungary in the next year and a half. Foreign banks account for roughly two-thirds of the Hungarian market, and with the exception of the country’s largest lender in terms of assets – OTP, most of the major banks are foreign-owned. The European crisis changed this dynamic. From a purely financial perspective, the devaluation of the Hungarian forint created serious problems for foreign banks operating in Hungary. Most of these institutions used to offer loans — most notably, mortgages — denominated in euros or Swiss francs. As people became increasingly incapable of repaying their loans, the Hungarian government passed two series of measures (in 2011 and 2013) that converted some of those loans to forints at a lower exchange rate. Brussels criticized Hungary, but it did not actually punish the government for converting the loans. Could there be a link between the European based ownership of the majority of Hungarian banks, the expected hostile appropriation of these banks by both the Hungarian government and business resources inside Hungary loyal to the government and the terrorist attack on 13 January 2014? Is it possible that a non-aligned actor, driven by the mortgage crisis be responsible? Could it be not financially motivated at all but rather simply a random act of violence which either used the bank/government political crisis as a ruse or it was simply a coincidence that it was in front of CIB? As of this report, no group has claimed responsibility for the bombing.